“I only write when I’m inspired,” wrote William Faulkner. I’d find that statement comforting if he hadn’t followed it with, “and I’m inspired every morning at 9:00 AM.” Lately, my every-morning-at-9:00 AM-ritual hasn’t included much writing. Oh, I’ve had plenty to write about, it’s just that I’ve over-committed myself (again) so that every spare waking minute seems filled with obligation. When I have a spare hour, I usually go fishing. Since I bet you’d much rather hear about the fishing than the excuses, I’ll dive right in. There’s nothing more inspiring than a big fish. That’s Uncle Phill Anderson in the cover shot holding up a nice light-tackle fish he jigged up on a recent foggy morning in the mid-Bay. (Shhh, don’t tell the meat-fleet we’re picking off fish of this class with light tackle. It might catch on!) When I left off a month ago, I was smack in the middle of a series about strike triggers. 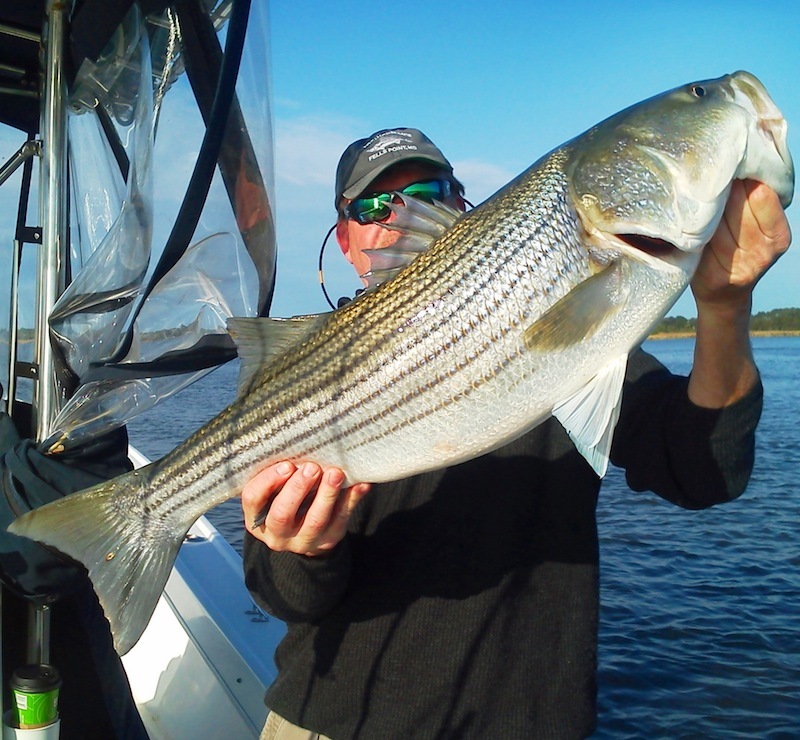 I’m discussing why striped bass attack a lure, and how they are attracted to their prey. As previously mentioned, almost any lure or technique will work on hunger-feeding fish. Unfortunately, most of us don’t have the time or resources to always go fishing at the places where hungry fish are most abundant. We have to fish in the limited time we have available, and usually very close to home. 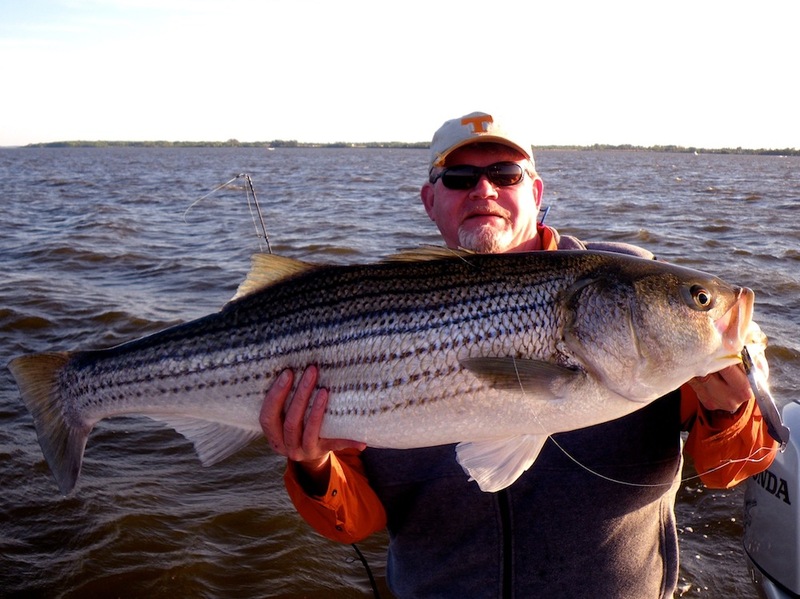 While we may occasionally encounter groups of ravenous fish, most of the stripers in our neighborhoods are pretty hard to catch. In order to be consistently successful, we have to provoke strikes from fish that may not be inclined to bite by appealing to their five senses. I’ve written about sight, sound, and feel. This entry completes the strike triggers series with a look at smell and taste. A Striped bass’s sense of smell is thought to be their most highly developed sense. If you look closely at their nose, you’ll see that they have nostrils (nairs) just like we do. At first glance it might just look like one hole on each side, but look closely. There are actually two on each side – one to take water in, the other to send it out. Stripers continually cycle water through their heads where it passes through chambers that are lined with sensory pads containing millions of olfactory receptor nerve cells. These cells send a message to the fish’s fore-brain where the odors are interpreted. It’s been estimated that stripers can smell thousands of times better than humans. Think of them as underwater bloodhounds that can be either attracted or repelled by the scents they encounter. I believe striped bass have the ability to detect scents from as far away as 100 yards. In addition to their advanced ability to smell, stripers also have a very well-developed sense of taste. By using the science of comparative anatomy, we know that they have the ability to distinguish between salty, sweet, sour, and bitter tastes. 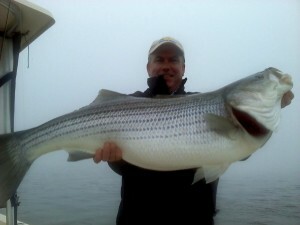 Stripers have taste buds inside their mouths, in their throats, and even outside their mouths on their lips. That’s right, they can actually taste a lure before they bite it. That explains why we come up empty a lot of times when we set the hook after feeling those bumps and taps on our jigs. Artificial lure fishermen have historically ignored smell and taste triggers in favor of reaction strike producing techniques like the movement and appearance of baits. That’s a mistake. Since fish are attracted to scents and can taste a lure before ever biting it, fishermen can increase their chances of hooking up by incorpo rating scents and smells into their presentation. Freshwater bass fishermen are way ahead of striped bass anglers in the use of scents. Most successful bass fishermen frequently doctor up their lures with gels, dips, and sprays. 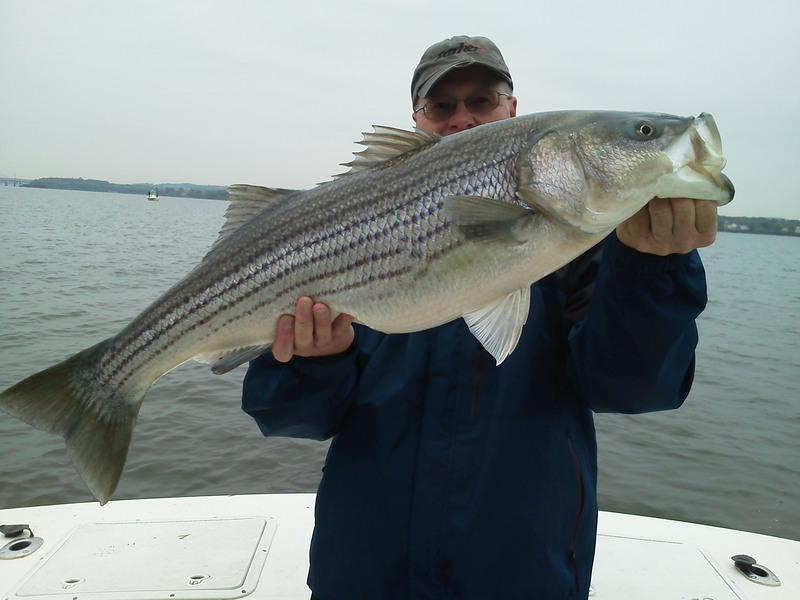 Fortunately, most scents that are designed for black bass will also work for stripers. Some commercial manufacturers have now started designing scents for striped bass. I apply scents to every lure I use, not only to attract fish and get more strikes, but to hide human odors like those caused by lotions, oils, and sunscreen. As a result, I think I get more bites than I would otherwise. I also think fish will more frequently return to strike a lure a second or third time if it smells and tastes attractive. Most of my fishing lately has been on weekends around Kent Island, but I’ve also managed a few late-evening trips to Fletcher’s Boat House on the Potomac River to fish for hickory and white shad. Shad fishing is a lot of fun, and it also provides some good lessons for striper fishing. Shad don’t attack lures out of hunger. Instead, all shad strikes are reaction strikes brought on by instinct. Sometimes, just the slightest change in lure style, color, weight, or retrieve will trigger more strikes and make all the difference in how many shad you catch. A good way to learn how to catch more rockfish is to study the strike triggers of hickory shad. The shad bite has also been good on the Susquehanna River near Deer Creek and at the Conowingo Dam. 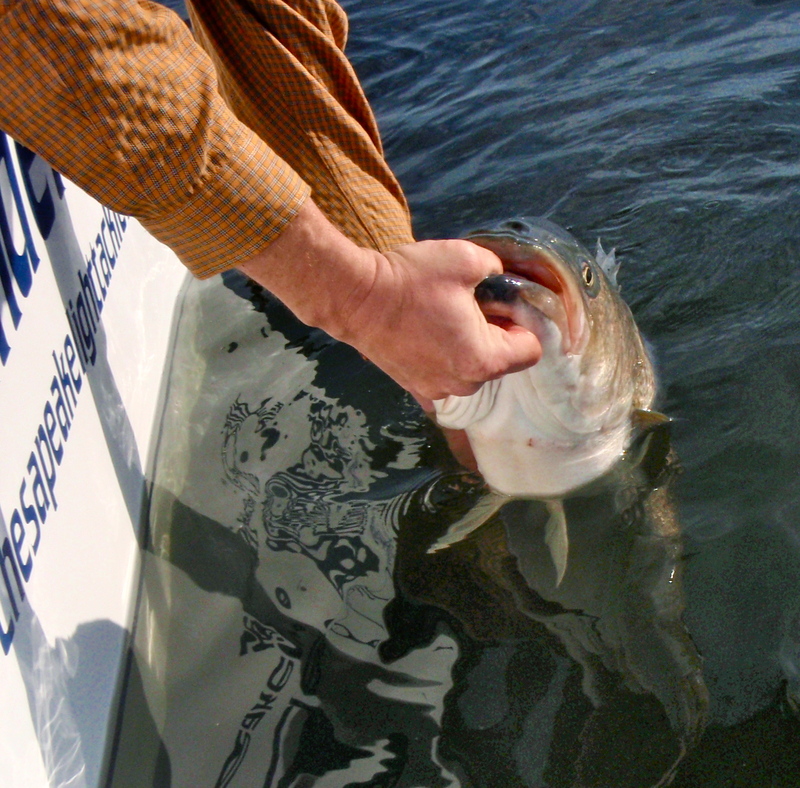 Some of the Eastern Shore creeks and rivers have also produced exceptional shad runs this spring. Many Chesapeake Bay light tackle fishermen are catching and releasing fish at the Susquehanna Flats. I’ve only made three trips to the Flats this year, mostly because I haven’t found too many bigger fish there. I’ve had a few in the 30-35 inch range, but this is the time of year for real trophies, and I can often find fish in that class much closer to home. I joined my friends Hank and Jamie for a trip to the Flats with light-tackle guide Walleye Pete a couple of days ago. Pete kept us on easy-to-catch hunger feeding fish all day and we had a lot of fun. Hank not only paid the guide fee, but also supplied a cooler full of pastries and sandwiches that were specially prepared in the kitchens of his company, Windows Catering. We ate like kings and caught a lot of fish, but they just weren’t the size-class we were hoping for. Jamie managed to catch one mid-30-inch striper on a pearl Lonely Angler spook. The Flats closes May 4th this year. After that, the season is closed for two weeks. It reopens with a single-fish catch and kill slot on May 16th. I’ve also made three short trips recently launching off the back side of Kent Island in Thunder Road and running south toward the mid-Bay. I’m no longer fishing the warm water discharges even though they are still producing a few fish. I prefer to fish humps and ledges where I can find a lot of moving water. 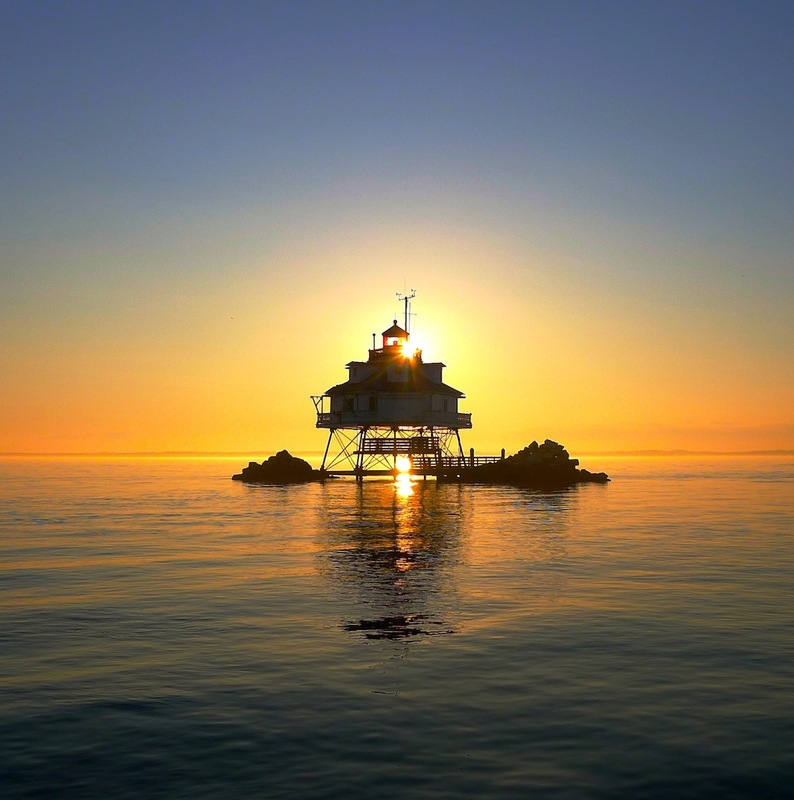 There’s bait moving into Eastern Bay now, but fishing is still tough. When I’ve found fish there, they’ve been few and far between. The ledges of the main channel are holding more bait, and occasional nice fish. The biggest news of this past week is that water temperatures have reached the low 60-degree mark at some places, and the mid-Bay top-water bite is turning on. I caught topwater fish Saturday and Sunday evening. Just like at the Flats, spooks out-performed chuggers. I also found fish willing to hit a jig Saturday morning and caught eleven up to 35-inches within a few miles of the boat ramp. I also heard about a mid-40-inch fish caught on a fly rod this past week. Now that’s inspiring! I expect topwater fishing to improve dramatically over the next couple of weeks. 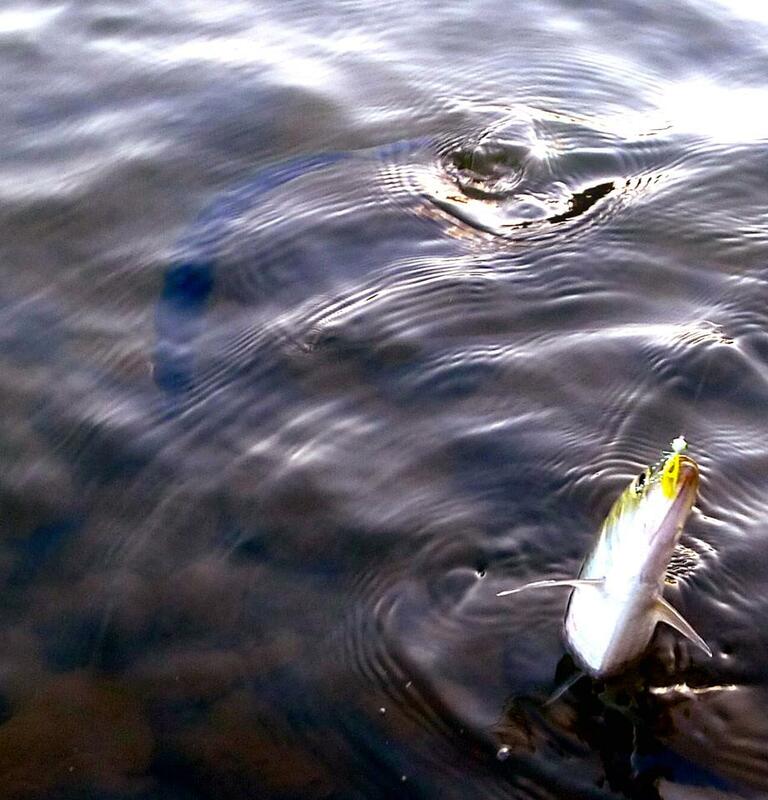 Look for high current locations where the fish have access to deep water. The best topwater spots are usually right under your nose in places most people blaze right past. 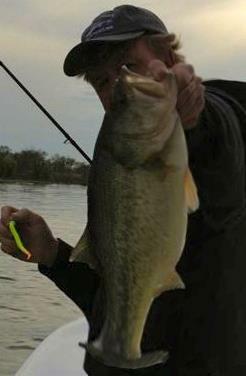 Don’t forget to add scents to your topwater lures. It’ll keep the fish coming back for more when they miss it the first time. I have high hopes for a good post-spawn jigging bite this year as well. 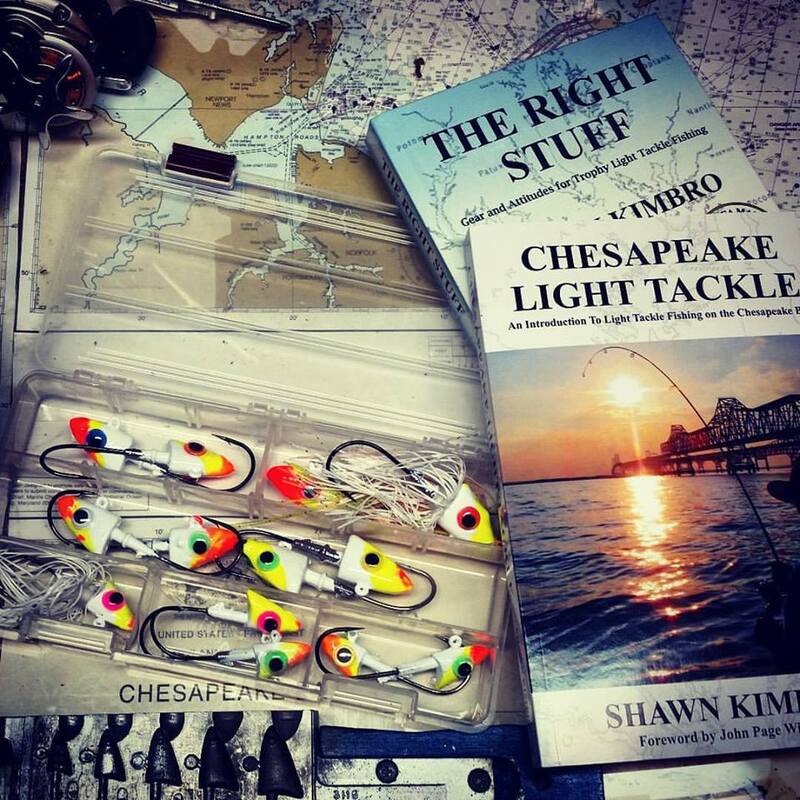 I think we’ll see good fishing in Eastern Bay and in the main Chesapeake channel near humps and ledges that are close to the mouths of major rivers. If conditions hold and patterns are similar to previous years, we’re just a couple of weeks away from a good Bay Bridge piling bite. Water clarity is as good as I’ve ever seen it for this time of year. Polish up your strike triggers, mash your barbs, sharpen up your hooks, then hang on for what could be one of the best post-spawn striper seasons we’ve seen in a while. Let’s get out there and get inspired! Great to see a write up from you again Shawn…time to get back in the groove Ol’ buddy..had a great time fishing the other night..those Ol’ trollers have no idea what they’re missing..watching a 30″ class fish explode on a topwater will definitely get the blood flowin’..see ya soon!.. That’s a gorgeous picture of Thomas Point. I’m glad to hear that the top water bite is picking up. Is the top water bite turn on earlier than usual this year? Thanks, and keep up the good work. Good Article!! Looking forward to seeing more giants!! Thank you Mr. Kimbro. I’m glad your back. A lot of people have missed your inspiration. Great article. Any suggestion for a brand or type of scent to start with if you’ve never used one before? Thanks! I’m not speaking for Shawn, but I went to his Striker Triggers talk and he mentioned that he uses SpikeIt a lot because it has color and scent both. Thanks for this good infor. I didn’t know how they could be so good at smelling things, but it makes sense now. Tim is correct, I do like SpikeIt Dip-N-Glo. I also like menhaden scented sprays on plugs or spoons since most already have color contrast built in. You need to reapply frequently. Think of it like bait fishing. Fishermen know that you need to replace bait every 15 minutes or so to increase your chances of catching. Fish are attracted to the smell of fresh bait, but repelled by rotting bait. Commercial scents usually don’t spoil, but they fade quickly so put it on every few minutes. I thought you were dead. Heard you were picking and grinning in Grasonville Friday night. I want one of your son’s latest CDs. Does it have that Cape Charles song on it? Shawn, I’d like to come over when your playing. Do you know your schedule? Maybe some music venue gigs coming up this summer, we’ll see how it goes. Gotta fish! Excellent read,plenty inspiration right here. Joe, the fish usually show up at the bridge once the post-spawn menhaden and river herring move out of the Chester. Lots of bait in Eastern Bay right now. Good indicator that it’s just a matter of time. Outgoings better in early May and watch the spots farther north first.